Childhood inspired Shipyard to make soda. In the 1920s, the story goes, young Eli Forsley made a business of sneaking down to the basement to get some of the family’s home-brewed root beer to give to friends and to sell. The boy grew up and served in the Navy, and when he returned and started his own family, he continued his parents’ family tradition of brewing root beer in the basement. Capt’n Eli’s soda is a homage to him from one of his sons. The brewery started with beer and, in 1996, it began making root beer. The company now bottles eight flavors that might make you remember when the beautiful school-free days of summer ended with a trip to the corner market. 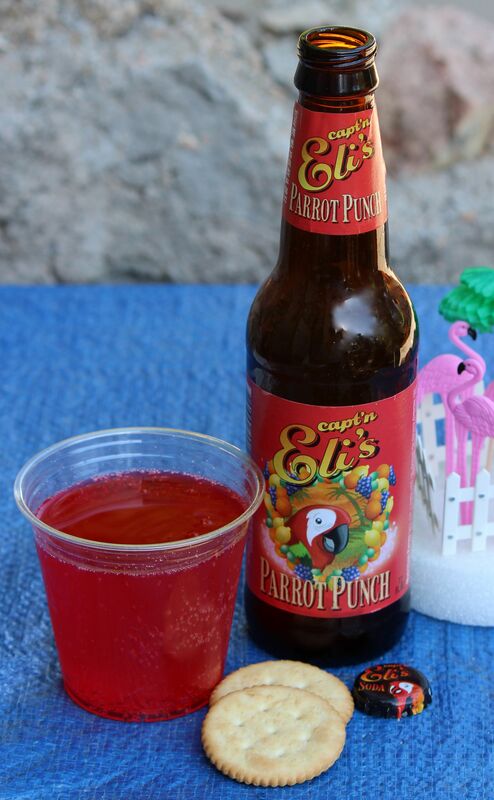 Parrot Punch hearkens back to the stuff in the big can or to the cocktail – takes yer choice! Arghhh! What’s in it: Water, cane sugar, natural and artificial punch flavors, citric acid, sodium benzoate (preservative). Appearance: Bright red, cloudy with big bubbles bursting on the surface. Aroma: Fruity, sweet; passionfruit, pineapple, orange. Flavor: Light fruit, slight acid; delicious to lick off the lips. Pairings: Peanut butter-and-jelly sandwich, salted popcorn. Notes: You’ll feel like a kid with this one, even if – maybe especially if – your parents forbade you from drinking soda when you were little. From the label to the glass, it’s playful.